I just noticed that I forgot to photograph the Miniature Red-White-Blue Ribbon winner, so I apologize to Jon Kawaguchi whose exhibit won that ribbon. 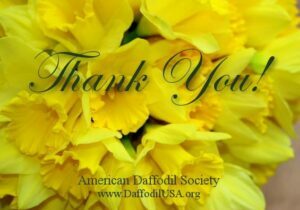 The class is for five miniature American-bred daffodils. The flowers in Jon’s winning exhibit were ‘Suzy Q’ 10Y-Y (Higgins), ‘China Gold’ 10Y-Y (Blom), ‘Apollo Gold’ 10Y-Y (Blom), ‘Oxford Gold’ 10Y-Y (Blom), and ‘Oregon Petticoat Group’ 10Y-Y (Blom). The Lavender Ribbon is for the best collection of 5 miniatures. Previously, exhibits in the American-bred collection class were excluded, but now all collections of 5 miniatures are eligible for the Lavender Ribbon. The flowers in the winning collection are — 09-024-1 7O-R, 99-114-9 2W-WPP, 08-056-1 10Y-Y, 06-020-1 11aY-Y, 09-973-1 8W-O. Front: 09-024-10 7O-R, 09-070-2 11aW-W, N. triandrus 13Y-Y, 09-024-4 7Y-R.
Front row: 09-059-1 11aW-Y, 09-024-8 7Y-O, ‘Little Karen’ 8W-P, 11-086-1 1Y-Y. 1st row: 09-024-5 2Y-R, 03-036-8 8W-WPP, 11-043-2 2YYW-W, ‘Puppy Love’ 2W-P, 10-052-1 3Y-R, 02-037-1 8W-P.
Front: X-246-5 11aY-O, 08-047-5 4Y-Y, ‘Itsy Bitsy Splitsy’ 11aY-O. Front row: 09-059-1 11aW-Y, 08-056-2 10Y-Y, 11-020-2 6W-Y, 08-011-1 11aW-Y. 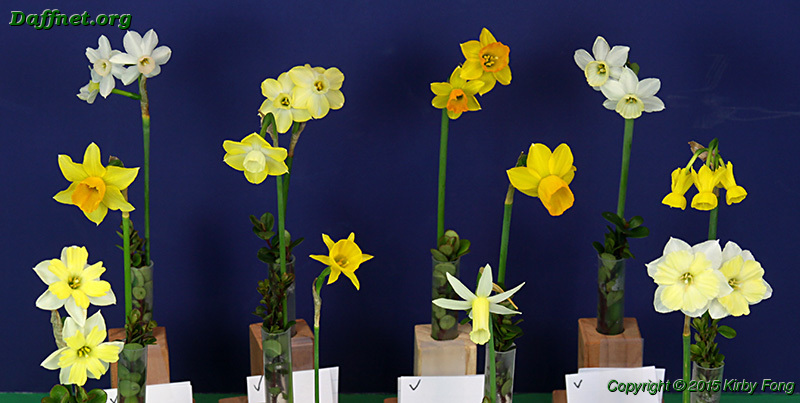 This concludes the postings of the ADS award winners at the 2015 Livermore daffodil show. The remaining award for which there is no exhibit is the Silver Ribbon for the exhibitor who won he most blue ribbons. It’s Bob Spotts with 43.